I attended a birthday party last week. It was in Ohio State Penitentiary, on the 60th birthday of Bobby Sands, the Irish political prisoner who died after 66 days on hunger strike back in 1981. He was 27 then and he was followed to his death by nine of his comrades. Younger people won’t remember it but anyone over fifty should remember how the name Bobby Sands went round the world. The New York Times editorialized how Bobby “bested” British Prime Minister Maggie Thatcher because he and his comrades showed real moral courage as they fought for their rights as political prisoners with nothing but their bodies, while she just showed vengeance and spite. 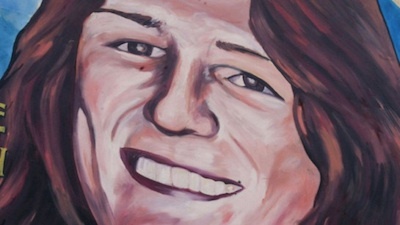 When Bobby Sands ran and won election to British parliament, while dying on hunger strike, he won 30,493 votes. The most Thatcher ever got was 29,697. Bobby spent the last five years of his life in supermax confinement: 24 hours a day, seven days a week, in an 8X10 foot cell. When I tell young Irish Americans about this they are shocked that an Irishman would be treated so cruelly by British jailers. Last week I was visiting my brothers Bomani Shakur and Jason Robb. Bomani and Jason, along with three others, are awaiting execution for their parts in a prison uprising in Lucasville, Ohio in 1993. There is no evidence that any of the five was involved in any killings that took place during the uprising but they led a movement to convince prisoners not to inform on other prisoners regarding any events that took place during the uprising. Bomani and Jason were offered deals by the state of Ohio to get very reduced sentences if they testified against other prisoners but they refused to do so and chose to save their souls at the possible cost of their lives. As punishment, the state fabricated evidence of guilt and withheld evidence of their innocence and stage-managed a series of trials that resulted in death penalties. The five men remain steadfast friends and comrades. Two are white, two black, one Sunni Muslim. They lived the past twenty years in supermax confinement: 23 hours a day, seven days a week, in an 8X10 foot cell. One hour they spend alone in a bigger cell, exercising. That is, until recently. In January 2011, after reading accounts of the Irish hunger strikes of 1980-81 and of the life of Bobby Sands, three of the men went on hunger strike to demand contact with each other and open visits, where they could touch their friends and family and break bread together with them. This we have been doing since the victorious end of their hunger strike, although Bomani and Jason remain chained to separate picnic tables during the visits. Yesterday, we bought a small cake from the vending machine in the visiting room. Jason, who is an accomplished artist, used the crayons and paper from the children’s play area of the visiting room to make birthday cards reading “Happy Birthday Bobby” and “Always Remember.” He constructed a birthday candle from paper, with a “flame” on the top, to decorate the cake. Together we celebrated Bobby’s life and his ongoing contribution to freedom everywhere. After the victorious hunger strike in Ohio, other prisoners around the United States read about Bobby and the Irish hunger strikers. Last year 30,000 men in California’s prisons went on hunger strike against solitary confinement. They organized the strike from a small area of isolated confinement called the short corridor that resembles nothing so much as the H-Blocks at their height of inhumanity, although these men do not even have windows in their cells. The men who organized the strike are African-American, Latino, and White. According to one recent report the men held all kinds of lively debates in their “pod” in Pelican Bay State Prison, but whenever the subject of Bobby Sands and the Irish hunger strikes came up the talk changed. “Every time we’d start talking about it, we’d notice the pod going quiet--we knew people were listening.” The state says that they are leaders of gangs that are at war with each other yet they have shown the deepest comradeship. The hunger strike lasted some 60 days and it may resume again if rights are not granted. Last month, dozens of prisoners in Menard “administrative segregation” (solitary) unit in the state of Illinois went on a hunger and then thirst strike for their rights. Again, they cited the example of Bobby Sands who, among others, has been responsible not only for politicizing large segments of the US prison population but for showing them a way that they can fight for their rights through nonviolent resistance. Soon, I believe, there will be a nation-wide hunger strike in the prisons here to protest against the inhumane policy of long-term solitary isolation, which since 1983 has put tens of thousands of men into total solitary isolation, some of them unable to touch another human being for decades. Now we hear that hundreds of undocumented migrants who are being detained in Tacoma in the state of Washington launched a hunger strike - on Bobby’s 60th birthday! All of the Irish hunger strikers and their families, those still with us and those who have passed from us, can take great pride in the fact that their struggle continues and that their example has given hope to tens of thousands of men who are still being held in “concrete tombs” in the richest nation in the world. * Denis O’Hearn is author of Nothing But an Unfinished Song: Bobby Sands, the Irish Hunger Striker Who Ignited a Generation (Nation Books).